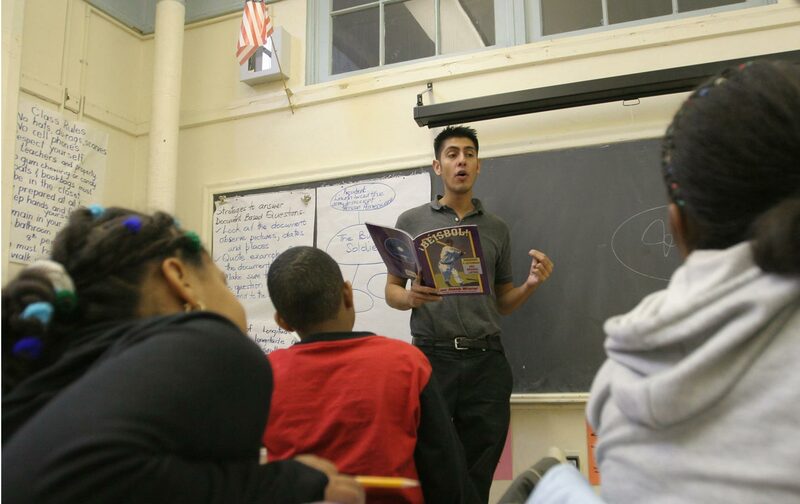 New York City’s public schools are falling behind. The average New York City public school teacher shows up at work every morning ready for battle. They may find themselves stressing over standardized test drills, confronting pressure from disciplinarian administrators, struggling to hold students’ attention in classrooms lacking chairs and books, or stretching threadbare budgets to keep supply closets half-filled. So at the end of the day, they may be too tired to fight to protect their labor rights. A new teacher survey from the rank-and-file caucus of the United Federation of Teachers (UFT) shows that educators are squeezed from both sides, by harsh standards imposed from above, and unmet needs among their students, and are left with hardly any room to do their job. According to the survey, conducted by the Movement of Rank-and-File Educators (MORE) in collaboration with the Solidarity Research Center, coping with students’ unmet needs is their chief challenge, both inside and outside the classroom: About one in five students in the city’s public schools have disabilities, one-eighth have limited English skills, and more than three-quarters live in poverty. About one in 12 kids doesn’t even have a home to do homework in. But their schools, too, are impoverished. About half of students are enrolled at overcrowded facilities, according to the survey, and nearly half of respondents report “the facilities they work in are not clean, in bad repair, and inadequate for student learning.” Subpar facilities are also starved of social resources: Nearly two-thirds say their schools do not provide “adequate special education staffing, planning time for teachers and mandated services for special education students,” and nearly half report similar unmet needs in support services for English language learners. Yet students with disabilities are supposed to be protected by federal civil rights mandates, which in turn raises the question of who—for all the emphasis on “teacher accountability”—should be held accountable if a school system is so under-resourced it literally breaks the law? But if the city is conserving resources to focus on academics, that’s not exactly showing up in the results either. On English language exam scores, for example, abysmal gaps in meeting proficiency standards persist between white students and black and Latino students; economically disadvantaged students trail their more affluent peers by 21 percent to 46 percent. Who should be held accountable if a school system is so under-resourced it literally breaks the law? Perhaps the biggest battle teachers face at school is against the clock. According to the survey, nearly all teachers work more than 40 hours a week, but do not earn overtime pay; about a fifth of teachers reported working over sixty hours a week. Reflecting a connection between job security and overtime, teachers without tenure tended to work more extra hours per week. High attrition rates for early-career teachers show the personal toll of these working conditions. Meanwhile, the teacher workforce has lost black and Latino educators in recent years. With only marginal pay raises provided in the latest contract, about 80 percent of respondents said they believed “the current union contract does not compensate teachers fairly.” About six in ten said they were “Dissatisfied or Very Dissatisfied” with union leadership. But MORE hopes their survey bolsters the case for a leadership shakeup in the upcoming elections. In a recent letter to fellow union members, chapter leader Jia Lee of the Earth School argued more rank-and-file members are seeking to elect officers who will help build “a union where we feel empowered to prevent the kind of negotiations that led to our current teacher evaluation system and contract, where we know that all of our members are confident in their ability to advocate for their work and their students.” The caucus criticized the recently negotiated contract for being weak on pay raises and failing to provide the job protections members were hoping to secure. The MORE platform aims to push the UFT in a more radical direction, forcefully opposing the standardized-testing system and defending tenure protections for not just teachers but all city workers. So when discussing their frustrations on the job at the next chapter meeting, teachers might build on a growing realization that not only are their teaching conditions also their students’ learning conditions, but collectively, these are also the political conditions in which change can occur.